When I was a kid, I went to Hebrew school and learned the Hebrew letters and the vowels. But when it came time for my bar mitzvah and I started learning to read the Torah, I noticed that there aren’t actually any vowels in the Torah, and I had to memorize the pronunciation of every word. Why is that? Is it just to make it super-hard to become a Jewish adult? As with many early Semitic alphabets, one who is fluent in Hebrew can, for the most part, read it without vowels, which is why even nowadays the overwhelming majority of Hebrew literature is written without vowels. On a simple level, the reason for this is because, unlike English, most Hebrew words are comprised of triconsonantal roots. Words with the same consonants are usually related, and differ only in how they’re inflected for tense and so forth. At the same time, there are also many words in the Torah whose meanings can change based on the vowels. And it is for this reason that an oral tradition was needed to tell us exactly how the words are to be pronounced. This, of course, leads us back to our original question: If there are ambiguous words, why leave the vowels to the Oral Torah? Why not have them written in the Torah itself? It is no wonder then that the letters are compared to the body and the nekudot to the soul.6 Like the body, the letters are tangible and physical. But the nekudot,while hidden, are what give them life. Rabbi Moshe Cordovero, Sefer ha-Pardes, Shaar ha-Nekudot 1. Exodus 23:19 and 34:26, and Deuteronomy 14:21. Ramban, introduction to his commentary on the Torah; Rabbeinu Bechayei, Deuteronomy 7:2. Zohar Chadash, Shir Hashirim 90a. See also Sefer ha-Pardes, Shaar ha-Nekudot 6. Why Do Sephardim Keep Their Torahs in Cylindrical Cases? 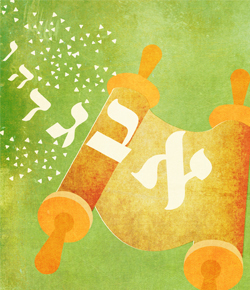 Why Two Rollers for a Torah and One for a Megillah? Do You Really Believe That the Torah Is Historical? It is certain that we need The Oral Torah to tell us the vowels of certain words in The Written Torah. The word Kosher, for instance, has three different ways you can arrange the vowels, all yielding different words, and thus different meanings. The Oral Law not only tells us which word specific letters are referring to. It also explains the meaning of those specific words proving that The Written Torah has to be talking about that word. So in other words, The Oral Torah actually explains the meanings of why The Written Torah is referring to that specific word. After all, Torah is endless and must include every logic and explanation possible. One could argue that Jews have been studying what these words are in The Written Torah for thousands of years, so we know what these words are in The Written Torah. But this still wouldn't explain the logic of why certain words arranged the way they are with certain vowels have to make sense for those specific vowels. Beauty in Simplicity – Is this comment p’shat, sod, both or neither? The more complexity a creation needs to have, the less powerful it is. Think of the power of language spoken by Gd. In ten divine utterances, a few simple Hebrew words, Hashem created the cosmos! What could be more concise and/or powerful? Think of the power of the pen and all the letters and books written, a fountain of everflowing wisdom. The pen is amazingly powerful - more powerful than the sword - but far less powerful than Hashem’s 10 utterances. When the author writes about the divine origin of vowels, and when he posits that the meaning of חלב is milk, that is P'shat, the simple, direct meaning and the one practiced Halachically, that is, in day to day life. When the author speaks of "the beauty of ambiguity," he refers to the lessons and anecdotes learned from different readings of the text. E.g. The Torah says that, "Abraham called (vayikra) in the name of G-d there." The sages point out that an alternative reading if the word is "vayakri- and he made others call," teaching us that we ought to influence others to call in His name. This that the author says that laws were derived from variant pronounciations, he refers to details within an already established P'shat (simple meaning) such as the number of a Sukka's walls. I suspect it's because of Kol Nidre. Being against all vows had to start somewhere! Hashem willing, sometime before the end of days you will fill in the - in G-d.
Re: Anne May Warrensburg Early adult hominids probably spoke differently because of comparative anatomical differences to modern humans. I did not mean to suggest anything about babies. In science, words of consonants are a part of lingual study of early hominids, especially Neanderthals. Science found that those with Jewish ancestry usually have the greatest remnant of Neanderthal DNA. IMO the Neanderthals are almost certainly the Canaanites. Judah took a Canaanite wife salvaging Canaan’s name in Torah: both a major difficulty and a great kindness and selflessness, something definitively Jewish. This compassion is of Judah, the one who in righteousness saved his brother Joseph from certain death. illogical reasoning No disrespect intended, but I was very disappointed by the article. Your first paragraph under the heading "the Power of Ambiguity" is actually completely inconsistent with the point made two paragraphs earlier. The first claim, that there is specific, divine origin of the nekudos, rebuts the ambiguity claim that allows transposition of the vowels for alternative meanings. Re: Rafael – Editing of Scribes Does Not Influence G-d’s Language Unlike other languages, G-d’s Hebrew does not change, even if it is lost for a time in the hands of men. Creation is subjective to G-d’s Hebrew, while English is more likely to be a subject of men. If English gets lost, we can always make another different language. When we study Hebrew, there is victory in getting closer and closer to the perfect original, first made known in the past. To my knowledge, English has no perfect original. If I say, “English, what comes to mind first?” – I’ll bet very few will say anything religious. To think that the Hebrew lanquage , pronunciation , meanings have not changed In 4000 years is a hard pill to swallow . Any oral tradition is tainted by the Sages and new creative meanings of Oral passages are instituted to remain valid within an era . When the Torah was finally written , it had already been redefined many many times by Sages Divinely authorized to redirect the tribes . Afterwards the Judean Talmud was overtaken by the Babylonian Talmud to reveal the meaning of the cryptic passages in the Torah . Absolutely wonderful Trying to understand hebrew as an adult -- well my grammatical correctness is pretty short of perfect, lol!! Sometimes i wonder if the unwritten vowels were not written down as a security barrier -- not between the cohen or the levites, per se, but as some other demarcation ... as the kabbala was not traditionally given to those who were under 40 years of age or unmarried.